Shelton Jackson Lee was born in Atlanta, Georgia, on March 20, 1957. He grew up in Brooklyn, New York. Lee's awareness of his African American identity was established at an early age. His mother, Jacquelyn, encouraged her children's enthusiasm for African American art and literature. She took her children to galleries, plays, and museums. Her position as a teacher at a private school was often the only income the family had. His father, Bill, was an accomplished jazz musician. Spike would sometimes go with his father to the clubs where he played. By the time Lee was old enough to attend school, the already independent child had earned the nickname his mother had given him as an infant, Spike—an indirect reference to his toughness. When he, his two younger brothers, and one younger sister were offered the option of attending the chiefly white private school where his mother taught, Lee chose instead to go to public school, where he would be assured the companionship of black peers. He graduated from John Dewey High School in Brooklyn. For college, Lee chose to go to the all-black college his father and grandfather had attended, Morehouse College, where he majored in mass communication. It was at Morehouse that Lee found his calling. Following his mother's unexpected death in 1977, Lee's friends tried to cheer him with frequent trips to the movies. He quickly became a fan of directors and movies of that time and discovered that he wanted to make films that would capture the black experience, and he was willing to do so by whatever means necessary. Lee pursued his passion at New York University (NYU), where he enrolled in the Tisch School of Arts graduate film program. He was one of only a handful of African American students. Lee went on to produce a forty-five-minute film that won him the 1983 Motion Picture Arts and Sciences' Student Academy Award, Joe's Bed-Stuy Barbershop: We Cut Heads. Although the honor improved his credibility as a director, it did not pay the bills. Lee worked for a movie distribution house cleaning and shipping film. When Lee filmed She's Gotta Have It a year later, his determination to be a director paid off. After Island Pictures agreed to distribute the movie, it finally opened in 1986. A light comedy, She's Gotta Have It pokes fun at gender relations and offers an insightful spin on stereotypical macho male roles. It packed houses with African American audiences and with a crossover, art-house crowd. With the success of She's Gotta Have It, Lee became known in cinematic circles not only as a director, but also as a comic actor. He played a supporting role in the film and was tremendously popular as this character. willingness to "air dirty laundry." Everyone agreed that the film was controversial. Do the Right Thing, released in 1989, confirmed Lee's reputation as someone willing to seize controversial issues by the horns. A story of simmering racial tension between Italian Americans and African Americans in the Bedford-Stuyvesant section of Brooklyn, the film becomes a call to arms when violence erupts in response to the killing of an African American man by white police officers. Critical response to the film was both enthusiastic and wary. Lee chose a lighter topic for his next film—a romance. The saga is about a self-centered jazz trumpeter, Bleek Gilliam, whose personal life plays second fiddle to his music. The movie explores the different relationships this man has with friends, family, and women. Bleek's character was inspired by Lee's jazz-musician father, Bill Lee, who wrote the film's score. Although recognized for its technical mastery and snappy score, Mo' Better Blues received unenthusiastic reviews. In Jungle Fever, Lee's next film, he looks at issues of race, class, and gender by focusing on community response to the office affair of a married, black architect and his Italian American secretary. Lee concludes that interracial relationships are often fueled by culturally based, stereotypical expectations. Sparking controversy from the beginning, the making of Malcolm X (1925–1965) became a personal mission for Lee, who had long been an admirer of the legendary African American leader. The film traces Malcolm X's development from his poor, rural roots to his final years as an activist. Lee worked hard to overcome many obstacles that threatened the creation of his masterpiece. His creative problem solving and dedication to the film were the forces behind its completion. Although Malcolm X received no Oscars, the film played a significant role in the elevation of the black leader to legendary status; it also spawned a cultural phenomenon often referred to as "Malcolm-mania." Promotional merchandise for the film was marketed by Lee himself through Spike's Joint, a chain of stores that comprise a portion of the director's growing business empire. In mid-1993 Lee began shooting his seventh feature film, Crooklyn, a comic tribute to his childhood memories of life in Brooklyn in the 1970s. He managed to take a break from filming, however, to marry Linette Lewis. Lewis, a lawyer, had been romantically linked to Lee for a year prior to their wedding. Crooklyn was released in 1994 to mixed reviews and a mild reception at the box office. Lee fared far better in 1995 with his next film, Clockers. It tells the story of two brothers who fall under suspicion of murder. One, a drug dealer, had been ordered by his supplier to kill the victim. The other, an upstanding family man, confesses to the crime, saying that he was attacked in the parking lot. The film won outstanding reviews, with some critics citing it as Lee's best work. In 1996 Lee released Get on the Bus, which focuses on a diverse group of African American men riding a bus on their way to the Million Man March (a rally organized in 1995 to celebrate the strength of the African American community) in Washington, D.C. They learn to overcome their differences as they unite for the march. Lee followed that film with 4 Little Girls, a documentary about the bombing of a Birmingham, Alabama, church in 1963, where four African American girls lost their lives. Lee works as an educator as well. He has taught at New York University and also at Harvard. In March of 2002 Lee became the artistic director of NYU's Kanbar Institute of Film and Television. He works with students on their thesis projects and helps them to make contacts in the entertainment field. Lee enjoys working with the students and challenges them to work hard. "Fight the power," the theme song to his 1989 film Do the Right Thing, could easily be Spike Lee's personal motto. From his earliest days as a student filmmaker to his $33-million epic Malcolm X, Lee has shown a willingness to tackle prickly issues of significance to the African American community—and has enjoyed the controversy his films produce. Bernotas, Bob. Spike Lee: Filmmaker. Hillside, NJ: Enslow, 1993. Hardy, James Earl. 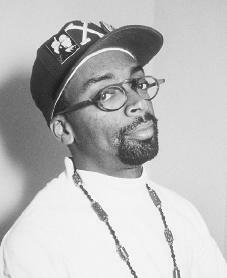 Spike Lee. New York: Chelsea House, 1996. Haskins, James. Spike Lee: By Any Means Necessary. New York: Walker, 1997. McDaniel, Melissa. Spike Lee: On His Own Terms. New York: Franklin Watts, 1998. Patterson, Alex. Spike Lee. New York: Avon Books, 1992. Shields, Charles J. Spike Lee. Philadelphia: Chelsea House, 2002.